Clean the mushrooms by removing the stem, the lining of the chapel and removing any traces of soil with a rag slightly dampened. Cut into very thin slices. 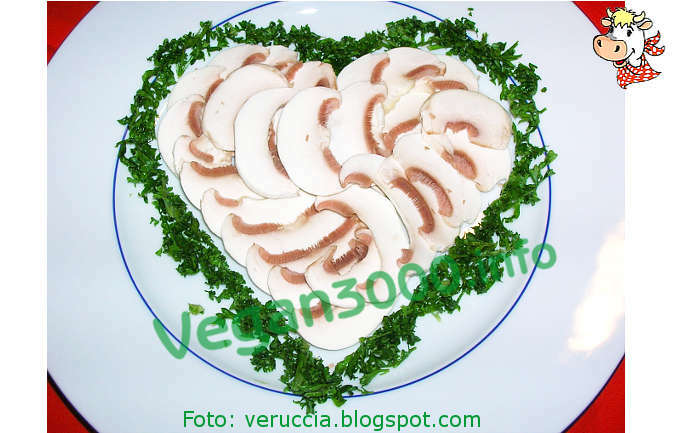 Arrange the slices in a serving dish forming a heart: you can help by following the shape of a pastry cutter, or making a cardboard frame, to be removed after you have decorated the mushrooms with chopped parsley. Prepare an emulsion of oil, lemon juice, water and salt; spread it on mushrooms, garnish with freshly ground black pepper, grated lemon peel and serve very light. Alternatively, you can combine the parsley to garnish and serve the mushrooms on a bed of tender baby spinach leaves.